Just Another Day...: Callin' All New (and soon-to-be) Mommies! Q: What in the world do these items have in common? A: They are just a few of the ingredients found in infant vaccines. Didn't see that comin', did ya? Okay. So I read several blogs written by fabulous ladies who happen to be chronicling their glorious pregnancies. Oh, the bliss of it all! So I felt inclined to share the dandy gem of information that had the greatest impact on my husband and I as new parents. See, we welcomed our first baby almost 11 months ago. To prepare for the blessed event (as best as one could), I read every book I could get my hands on to learn what to expect, what to do, how to do it and when. Flash forward a few months: our baby arrives and we couldn't be happier! We do all the things we're told we're supposed to do, including taking her for her check-up appointments at a few days old, 2 weeks and 2, 4, 6 and 9 months. Our pediatrician has been a valuable source for information about how much she should be eating, what she should be eating, how much she should sleep, etc. But there was one thing our pediatrician didn't provide us unbiased information about: vaccines. Our little one had anywhere from 3 to 5 shots at each of her check-up appointments. It wasn't until my husband's coworker mentioned something about vaccine safety (and recommended a book--more on that in a sec), that we began to question the process. We just assumed if the pediatrician said she needed these four vaccines at her visit, that it was fine and dandy! Plus we assumed we needed to comply with state regulations for when the time came to put our LO in school. That's a lot of assumptions! 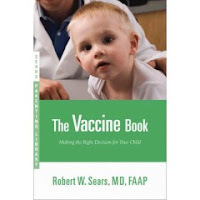 So about the book: It's written by Dr. Sears and it's called The Vaccine Book. "My main worry about this schedule is that there really hasn't been enough research on the various chemicals and ingredients in many vaccines to prove that they are 100% safe. It has also been my experience that giving 5 or 6 vaccines at a time can increase the likelihood of a severe reaction. My Alternative Vaccine Schedule circumvents these theoretical worries and provides complete vaccine coverage, but at a more reasonable pace." Okay, so ultimately it is every parents individual responsibility to make the decisions that are best for their child. I just felt it was necessary to communicate this fact to all of the new mommies (and mommies-to-be) out there in hopes that you will be empowered to make the decisions that are best for your child. If you're interested in learning more about Dr. Sears, click here to visit his website. I'm horrified by vaccinations. It's one of the only things that truly frightens me about having kids. Ugh. I had no idea about it until after we had our Little One. Now it totally freaks me out. But it's nice that we can decide to hold off on more "controversial" shots (like the MMR) until LO is older since she's not in daycare. Whew! i had a friend recommend that book to me. i'll have to check it out.